Round LED lamp is used in commercial office, retail, restaurant, school, hospital, multi family, and hotel/motel locations in interior hallways, bedrooms, utility/laundry rooms, living rooms, or recreational rooms. 4000K, 50,000 hours average life. UV, IR and mercury free. UL/cUL Listed for damp locations. Spin light, used in residential, office, retail, restaurant, school, hospital, and hotel/motel locations in bathrooms, closets, utility rooms, interior hallways or interior stairwells. Can be wall or ceiling mounted. Mounts to all lamp holders. Round, 4,000K, white. UV, IR and mercury free. UL/cUL Listed for damp locations. Indoor flush mount ceiling fixture, white finish, white opal hand blown glass globe. 7-1/4" x 5-13/16". Traditional design. Dimmable when used with a compatible dimming switch. 620 lumens. 8 watts, equivalent to one 60-watt incandescent bulb. 50,000 average rated hours. ETL/CETL listed, ENERGY STAR qualified. Compact-design channel and cover are formed from code-gauge cold-rolled steel. High-gloss, baked white enamel finish. 4000K. Diffuse polycarbonate lens. Indoor location. Fixture may be surface or suspension mounted with appropriate mounting options. Fixture is an integrated LED light, so no bulb to need to replace. CSA certified to US and Canadian safety standards and listed suitable for damp locations. 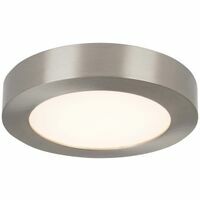 Ceiling light fixture, dimmable, LED, white, installs through use of direct wire. Indoor flush mount ceiling fixture. Frosted acrylic shade. Traditional design 1-7/8" X 11". Dimmable when used with a compatible dimming switch. 1100 lumens. 20 watts, equivalent to one 75-watt incandescent bulb. 25,000 average rated hours. ETL/CETL Listed. Decorative indoor, residential LED low profile square. 4000K, 120 volts. White acrylic diffuser. Hidden cam-latches provide easy diffuser removal for installation and maintenance. Works with most standard incandescent dimmers. All mounting hardware included. cULus Certified to US and Canadian standards and listed suitable for damp locations. ENERGY STAR certified. Ceiling light fixture, dimmable, LED, white, installs through use of direct wire. Matte white acrylic diffuser. Works with most standard incandescent dimmers. 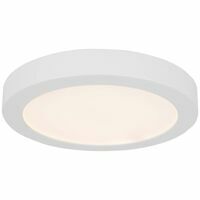 LED flush mount provides general illumination in commercial and residential applications. 50,000 hours life. 9.3 watts, 120 volts, 60 Hz. 4000K, 660 lumens. All mounting hardware included. 1-3/4" x 7-1/4". 1.1 pounds. CSA Certified, Energy Star Certified. White alabaster glass. Traditional design. 4-3/4" x 11". No bulbs to replace, includes integrated 15 watt LED, 930 lumens, equivalent to one 60W incandescent bulb. ETL/CETL listed. ENERGY STAR qualified. White alabaster glass. Traditional design. 4-3/4" x 11". No bulbs to replace, includes integrated 15 watt LED, 930 lumens, equivalent to one 60W incandescent bulb. ETL/CETL listed. ENERGY STAR qualified. White finish with white alabaster glass. Traditional design. Dimmable when used with a compatible dimming switch. 3-7/16" x 11". Integrated 15-watt LED, 1000 lumens, equivalent to one 60-watt incandescent bulb and lasts up to 30,000 average rated hours, ETL/CETL listed, ENERGY STAR qualified. White alabaster glass shade. Traditional design and LED technology. Dimmable when used with a compatible dimming switch. 3-7/16" x 11". Includes installation instructions and mounting hardware. 15-watt LED is equivalent to one 60-watt incandescent bulb. ETL/CETL listed, ENERGY STAR qualified. White alabaster glass shade. Traditional design and LED technology. Dimmable when used with a compatible dimming switch. 3-7/16" x 11". Includes installation instructions and mounting hardware. 15-watt LED is equivalent to one 60-watt incandescent bulb. ETL/CETL listed, ENERGY STAR qualified. LED universal surface mount downlight. Over 600 lumens, 90 CRI, 3000K, 120V, 50,000 hours. Flexible mounting with junction box bracket (included). Compatible with most recessed housings. Slot-N-Lock quick installation system. Ceiling and wall mount capability. Wet location listed - ceiling and IC (Insulated Ceiling) rated. Compact-design channel and cover are formed from code-gauge cold-rolled steel. High-gloss, baked white enamel finish. 4000K. Diffuse polycarbonate lens. Indoor location. Fixture may be surface or suspension mounted with appropriate mounting options. Fixture is an integrated LED light, so no bulb to need to replace. CSA certified to US and Canadian safety standards and listed suitable for damp locations. Used in residential, office, retail, restaurant, school, hospital, and hotel/motel locations in bathrooms, closets, utility rooms, interior hallways or interior stairwells. Can be wall or ceiling mounted. Round, white. 50,000 hours average rated life. UV, IR and mercury-free. UL/Cul Listed for damp locations. Used in residential, office, retail, restaurant, school, hospital, and hotel/motel locations in bathrooms, closets, utility rooms, interior hallways or interior stairwells. Can be wall or ceiling mounted. White. 4,000K, UV, IR and mercury-free. UL/Cul Listed for damp locations.